Chicago's bookselling business lost a leader late last month when Pat Peterson resigned as general manager of Barbara's Bookstores and moved to Normal to become associate director of the Dalkey Archive Press, a small but well-respected publisher of serious fiction. Though Peterson will continue to serve in an advisory capacity on the Barbara's board of directors, now that she's no longer a Barbara's employee, her stake in the company will revert to owner Don Barliant and his wife, Janet Bailey, who live in Santa Fe. Peterson's former responsibilities will be divvied up among three people. Later this month, Barbara Stuark, who's previously handled retail operations at the Field Museum and Brookfield Zoo, will become general manager of all the Barbara's stores. Janet Bailey and Barbara's operations manager Isabella Reitzel will split up Peterson's book-buying responsibilities. To some, Peterson's departure is a sign that the worst may not be over in the battle between the chain stores, such as Crown, Barnes & Noble, and Borders, and the independents, which were once the dominant force in Chicago bookselling. "Pat's departure raises a lot of questions," says Unabridged Bookstore owner Ed Devereux. Devereux, who's cut his staff from ten to seven, estimates he's lost a couple hundred thousand dollars in sales to the chains over the past couple of years. "All that has been happening has made me a better businessperson, but perhaps Pat saw the handwriting on the wall." Peterson says a desire to change her lifestyle prompted her to move downstate, not a concern that Barbara's was threatened. "I would be deeply offended if anyone thought I was run out of town," says Peterson, adding, "I think there are a lot of opportunities for good independent bookstores in Chicago." But the bookselling business in Chicago remains in a state of upheaval. Stuart Brent, a respected Chicago bookseller for nearly 50 years, will close the doors of his North Michigan Avenue store on January 31, 1996. "The pleasure young people once got out of reading good books is fading," says Brent, adding, "Something tremendously terrible is happening here." The city's largest independent bookseller, Kroch's & Brentano's, collapsed and disappeared earlier this year. But Peterson believes Kroch's demise wasn't entirely due to the arrival of the superstores: "The superstores were just the final blow to a chain that had been dragging its feet for a long time." Peterson, who worked at Barbara's for 19 years, didn't flinch when the giant chains moved into town and altered the dynamics of what had been a relatively genteel business. Aware that Barbara's couldn't compete with the giant inventories and in-store cafes at the superstores, Peterson concentrated on offering custo-mers a selection of the best books pub-lished and good service from her knowledgeable staff. Though Peterson was originally reluctant to introduce the kind of discounting prevalent at the superstores, eventually she began marking down her best-sellers and offering discounts every month on books in a certain subject area, such as gardening or travel. One of Peterson's last major tasks at Barbara's was opening the new Barbara's Bookstore at Navy Pier, a location not likely to be invaded anytime soon by a superstore. In the past couple of years she and Barliant also opened two small bookstores, called Barbara's Bestsellers, in high-traffic commuter railroad stations. The stores--one here in Chicago at Northwestern Station, the other at South Station in Boston--sell only those books that have proved popular at Barbara's larger stores, which ensures that inventory turns over quickly. Barliant, who plans to open more of these stores in other markets, argues that their profits will help Barbara's survive until the inevitable shakeout makes the remaining independents more competitive. In the meantime Barliant is bringing in Stuark to help determine how each Barbara's store can best serve its neighborhood. "Barbara will concentrate on running the stores--their look and feel, as well as the strategic planning," says Barliant. Stuark believes it would be suicidal for Barbara's to compete head-on with the superstores. "We can't be all things to all people." Thus the emphasis on the individuality of its stores. "We don't want our stores to look as if they all were created from the same cookie cutter," says Reitzel. Customers at Barbara's on Wells, for instance, have a taste for photography and cooking, while customers at the Broadway store go more for politics and philosophy. 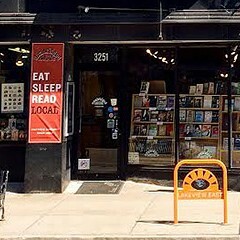 Late next month Barbara's on Broadway and Unabridged will face another challenge when Borders Books & Music opens a 40,000-square-foot store at 2817 N. Clark, the former site of a Great Ace. Ten years ago Barbara's and Unabridged reigned supreme in Lakeview. Now they must share the customer base with Borders, Barnes & Noble, which has a store just around the corner from the new Borders, and Crown, which has a store at Diversey and Halsted. Garrett Auriemma, spokesperson for the new Borders, plays down the bookstore wars: "We hate to see ourselves in competition with other bookstores." Art accompanying story in printed newspaper (not available in this archive): Eugene Zakusilo. But there were some bumps along the way.